Hacking Wifi is useful since we want to test our defenses, to make sure we have a certain level of defense set up. As in this tutorial by WonderHowTo there is a few steps one has to perform before capturing data from the targeted Wifi Access point. 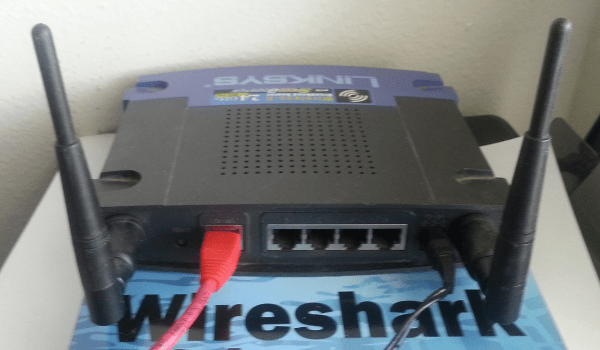 First one has to set up a Wifi card that is accessible by airodump-ng for the aircrank-ng process attempt to crack the WEP or WPA password key of the Access point to be tested. One then accumulates a certain level of data before trying to crack the code. Aireplay-ng – it can generate or accelerate traffic on the Access point, potentiall run WEP and WPA2 password attacks as well as ARP injection. Airolib-ng – stores or manages ESSIDs to help crack the password cracking. Airbase-ng can make the laptop/computer into an Access point. The reason one wants to spend time testing defenses is that Wifi tends to be set up and then forgotten, and if it was set up incorrectly then it should be fixed. All the white responses are the attempts at hacking, while the green text response was the successful attack with the correct password. Interesting to note, but if CAPTCHA is implemented well, this method will not work at all. So let’s say one is a criminal hacker, the key is to find a good password file (from known passwords on the internet) there are likely files out there which allow the criminal to amass a decent password file, which would allow you to attack sites with this password dictionary file. Or one can generate a fgile on their own. A good Google search can start the hacker on the way to building this file. http://security.stackexchange.com/questions/1376/where-can-i-find-good-dictionaries-for-dictionary-attacks is an example. of a link. There is a list of password dictionaries at this site https://wiki.skullsecurity.org/Passwords . There are some lists that were used by the Conficker worm to spread. As well as some leaked passwords (like from Sony etc. that have been compiled here. So you can see it is a relatively straight forward method to try and go after online websites that have username and passwords. Why am I saying this? Because we ahve to become better at making passwords, change your passwords, make them longer and use less known words combinations with numbers and special characters. And the longer the better, to the tune of 10-20 letters. Check this xkcd comic: http://xkcd.com/936/ Tries to show pictorally that it is better to run together several words rather than using difficult combinations that cannot be remembered. How Dangerous is SQL Injection? As it states in the image (from the kalitutorials website) the second statement gives you access to data of all accounts. Why is this? because a 1=1 statement is “true” and we also have to enter something in the password field. If the SQL data entry process (or function) does not dismiss this potential entry then there is a possibility that the SQL database response will be with all data or at least all data for the way the SQL function is calling in a specific table. As the website mentions this is basically what the tools are performing in an automated manner, maybe with some variations in entries. 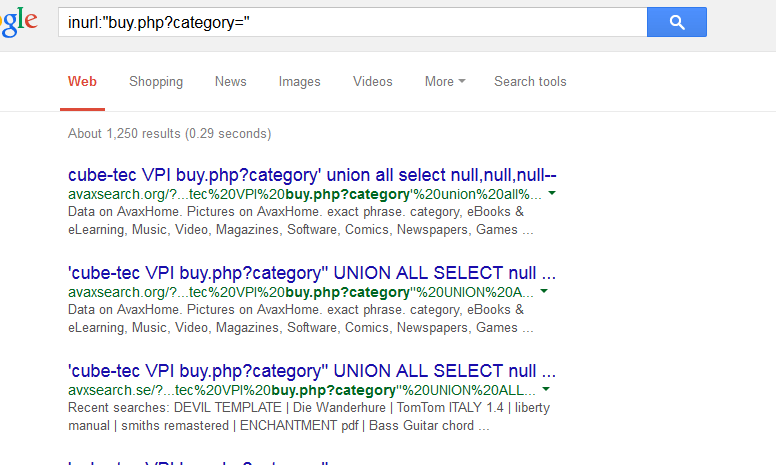 Another interesting bit of information are Dorks (an input query into a search engine(Google for example) which attempt to find websites with certain text included: inurl:”buy.php?category=” for example. this is how your website can be “found out” by criminal hackers, as they try to find victims of their attacks. As the hacker starts to map all your data they will get more and more info that is not really for public consumption (or so it was thought). It is not a good idea to give out too much information without knowing any circumstances. As an ethical hacker one needs to have permission to attempt to crack(or hack) a database interface. And if it is giving out too much information then one has to mitigate this situation. At this point I will leave more sqlmap hacking for a specific pentest situation. Contact Us to discuss further details. 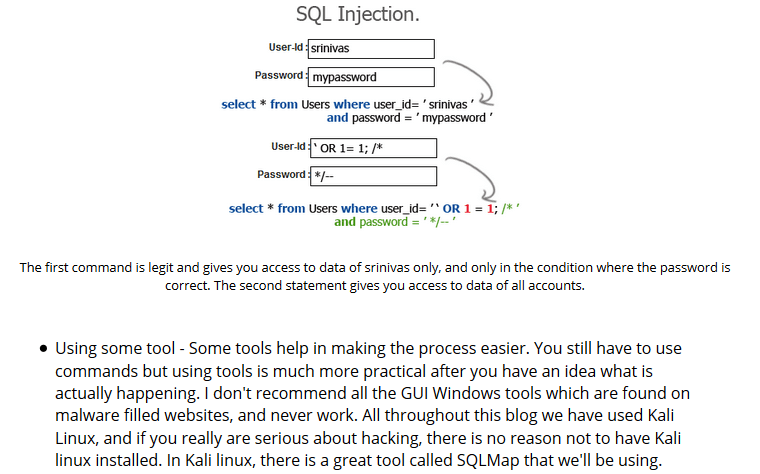 Author zafirtPosted on April 8, 2015 Categories ITSecurity TrainingLeave a comment on How Dangerous is SQL Injection? His assertion is that the experience trumps the formal education, in fact with someone that came out of college with a degree, usually has 4 years working at the degree, so you add 1 or 2 years in the working world it does seem that a college degree (even in computer science or an engineering degree) would not give the same outlook on a cyber security job than someone with 5 years in the working world without a 4 year college degree. I think he misses the point that we need someone with experience(2-5 years or more), and a college degree, since the difficulties in today’s cyber security field will not become simpler. There is nothing like being placed in a situation that was not in the books, was not taught by the college instructors, and the person has to figure it out on the job as it comes. A Certified ethical Hacker has to have at least 4 years of security experience or have 3 years of security experience plus a college degree. So the college degree is worth 1 year of experience not 3 or 4. 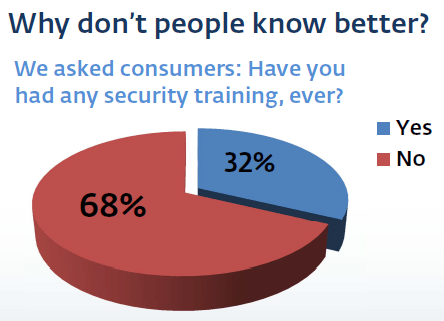 Most people do not understand cyber Security and have had no training. That makes sense, this is why we have this big problem of phishing and malware downloading. the general understanding of Cyber Security is horrible. Thsi is also why senior execs have such a low understanding of the true problem at hand. Oversitesentry.com and fixvirus.com is trying to change that. Little by little we are trying to help. I clicked on the response tab after Owasp-Zap tries to execute a variety of illegal attempts on my website. If you have a website and need this done all you need is a copy of Kali-Linux and permission to “attack” the site. 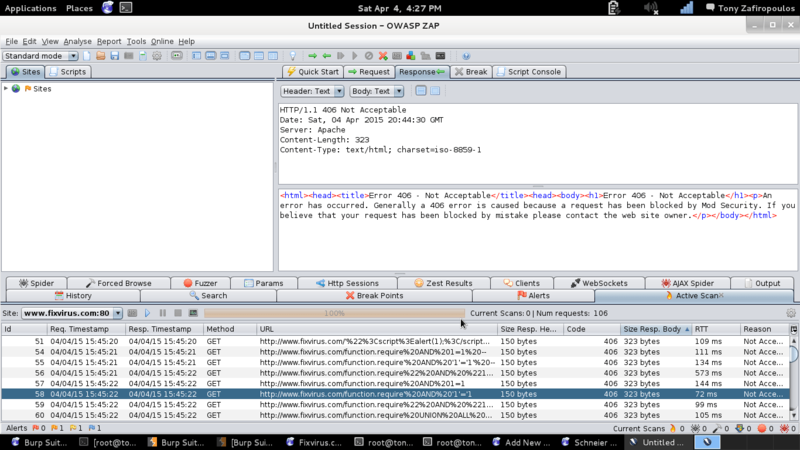 As you can see OWASP runs a variety of GET commands with some attempts at sql injection and more logic testing. It has been shown when you enter “1=1” in a form the system responding may come back with more data then it was supposed to… why would it do that? Well for some reason the person developing the website code did not do enough security testing. This is a basic thing cybersecurity, but we want to review it with all. Running a basic owasp-command is just the beginning… After a security professional starts with that initial test, depending on the responses further tests may be warranted.